A video distributed Monday shows the leader of the Nigerian Islamic extremist group Boko Haram saying he is willing to trade more than 200 kidnapped teenage girls for imprisoned members of his group, and offered the first evidence that most of the girls are still alive. The video, which was obtained by the French AFP news agency, shows Boko Haram leader Abubakar Shekau addressing the camera with an automatic weapon in his first online appearance since claiming responsibility for the mass-kidnapping and threatening to sell the girls into slavery. In another portion of the video dozens of young women in traditional Muslim dress are seen gathered in an outdoor area, chanting verses from the Koran in unison. Approximately 150 young women can be seen in the video. At one point a single girl addresses the camera in front of the group, appearing nervous, and recites Koranic verse. Shekau addresses the camera in a different setting, appearing alone with his assault rifle and speaking in his native Hausa language. 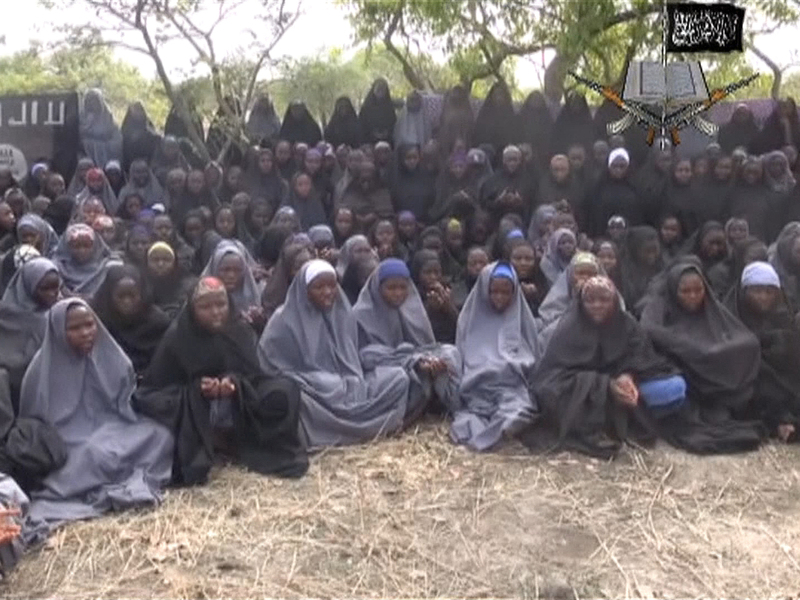 He asserts that Boko Haram has "liberated" the girls already, referring to many who he claims have "become Muslims." "If you want us to release your girls we kidnapped, those of them that have not accepted Islam, they are now gathered in numbers. And we treat them well the way the prophet would treat well any infidel he seized. They are staying (with us). We will never release them until our brethren are released," Shekau says in the video. He does not name or identify any specific Boko Haram prisoners he would want released in exchange for the girls, but rather seems to suggest the Nigerian government would need to free imprisoned militants en-mass in any exchange deal. "It is now four years or five years that you arrested our brethren and they are still in your prison," Shekau says, calling for the release of prisoners held across the nation. There was no immediate reaction from Nigerian officials. The video appears to confirm information from a source who told CBS News on Friday that Boko Haram was interested in making a prisoner swap deal. Correspondent and CBS News contributor Debora Patta reported Monday for "CBS This Morning" that the source had suggested the new video could contain a coded message to the Nigerian government, which is believed to be involved in back-channel negotiations with the militants already. Boko Haram kidnapped about 300 girls from their school in the northern Borno state more than four weeks ago, and the Islamic extremists still hold 276 as the U.S., Britain and other nations ramp-up efforts to help the Nigerian government find and rescue them. Shekau's group is based in Borno, and is believed to be holding most of the girls in the sprawling Sambisa forest where the militants are based. The remote, rough terrain and Boko Haram's comparatively thorough knowledge of it have slowed search efforts to date, but the Nigerian government has also been heavily criticized for reacting too slowly from the beginning of the ordeal. Experts have expressed concern that many of the kidnapped girls may already have been smuggled across Nigeria's borders into Chad, Niger or Cameroon. Patta reported Monday that, according to her source, the Nigerian government was using a two-pronged approach; continuing search and rescue operations in conjunction with its international partners, while also setting up a committee to negotiate directly with Boko Haram.